Pewter is an alloy of tin that has been gracing homes for more than 3500 years. The Egyptian civilisation, the Roman Empire and mediaeval Europe all appreciated its qualities. Today’s pewter maintains its soft shine and represents an environmentally sound metal that is wholly appropriate for the use of contemporary artists. Modern British pewter is typically made up of tin (92%), antimony (6%) and copper (2%), sometimes referred to as Britannia Metal. Because it is lead-free, it keeps its bright shine and is non-toxic. Some old pewter develops a grey patina and has a metallic smell due to its lead content. In the 14th Century, because the metal could be worked so easily, it largely replaced wood, pottery, stone and leather as the main material for the making of domestic items. Furthermore, worn out pewter items could be recycled. The Worshipful Company of Pewterers was set up to control the quality of pewter and the trade became of great economic importance. This situation lasted until the start of the 19th Century when fine china, glass and stainless steel became available in large quantities. Craftsmen today use techniques such as casting, spinning, hammering and chasing to produce a range of decorative products for use in the home or the office, often to celebrate important events. 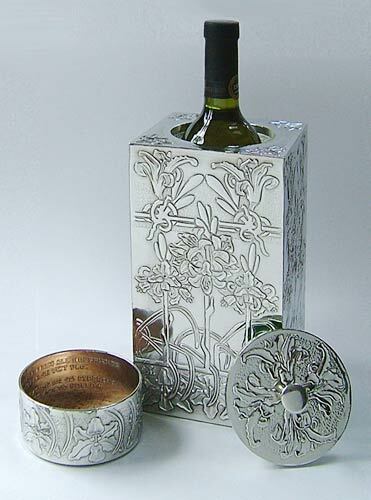 The repoussé technique is used to produce a bas-relief effect in pewter foil allowing any image to be transferred to the metal by hand. Treatment of the surface enhances the reflective interplay between polished and matt areas. The designs can include references to several aspects of a main theme thus offering unique opportunities for bespoke creations.